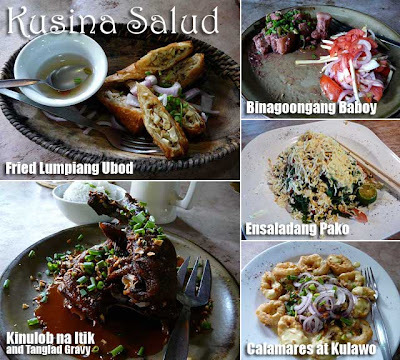 After our tour of the seven lakes of San Pablo, Laguna last week, we decided to have lunch at Kusina Salud. 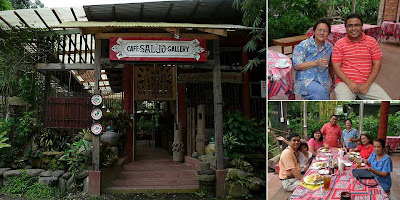 I've always wanted to visit the place having been invited by Patis Tesoro for the longest time to drop by. I called her in the morning but she was at a planting rice festival in Sta. Rita, Pampanga. But we had lunch there anyway. It's a bit further down the National Highway, past the city proper of San Pablo, in Barangay Sta. Cruz Putol. 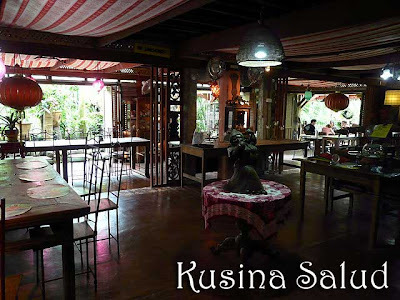 Make sure to watch out for the sign on the left which points to the road leading to Kusina Salud. We had a really filling lunch which included lumpiang ubod, calamares, kinulob na itik and binagoongang baboy. The pandan tea was refreshing as well. 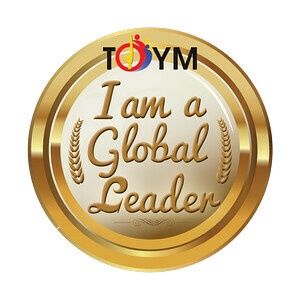 We couldn't stay long though since I had to catch a meeting in Manila early that evening. If I wasn't rushing, I would have tried out their spa. Today, I had merienda in Kusina Salud again with my family. We were planning to have lunch but we arrived after 2:00 p.m. and by that time, the menu changes. But the merienda they serve is filling as well. I had an adobo sandwich. This time, Patis was around and since we were the only other guests (aside from the French ambassador), she was able to join us for a while before her siesta. We were thinking of dropping by Ugu Bigyan's place before going home but it was getting late and we had to drive back to Manila. I'll check out more of the establishments on the Viaje del Sol scattered around Laguna, Cavite, Batangas and Quezon when I have the time. There are several buses that can take you from Manila to San Pablo, Laguna. San Pablo City can be reached via JAC, JAM, N. Dela Rosa and Lucena Lines from Cubao or Buendia. The signboard on the bus should say Lucena via San Pablo. Last daily trip is at 9 p.m. It's a two-hour ride depending on traffic. 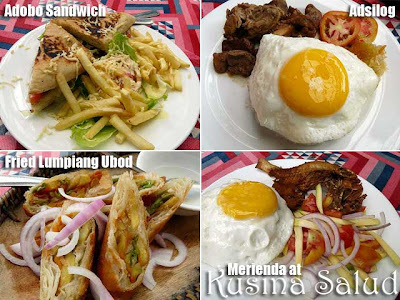 Food is good at Kusina Salud but I wish they keep them warm when they do buffets. It is a big turn off to eat cold food. I'll try their buffet one of these days. Sayang it's only on Sundays. Oh boy... after reading this blog, I'm perfectly capable of getting on a plane to go and make a round of all the excellent restaurants in the country!